The price of gold is going up, according to Money Morning Resource Specialist Peter Krauth. He says the recent pullback in gold prices was actually a healthy indication they would rise again this year. Between August and mid-February, the precious metal rebounded 14%. Had this been a larger gain, the correction might have been worse. Gold prices have fallen by about $60 off the recent peak, but Krauth says gains in the price of gold shouldn't necessarily be linear. Ideally, it's a series of several steps forward with an occasional step back. Thanks to the Fed renewing its dovish outlook, reduced real rates will also serve as a catalyst for higher gold prices this year. There is a seasonal factor to the rise of gold prices as well: Gold generally hits a bottom around the middle of March and then begins to climb through May. In the past week alone, gold has already bounced back to around $1,286, which is a strong indication we've passed through the correction. Knowing these things, here's what you can expect to gain from gold in April 2019. Gold produced significant gains between August and February, so the slight correction didn't come as a shock. But the rebound has been swift, with gold prices hitting a peak of $1,346 on Feb. 20. There was a gain of 14.6%, or $171, from the low in August of $1,175. The correction gave back about 4.5% of that gain, or $60 to a price of $1,286. There was a nearly perfect negative correlation between the gold price correction and a five-day delay in the U.S. Dollar Index (DXY). The DXY shows the dollar hitting bottom a few days after the February peak in gold prices. Then it peaked just after gold hit its recent low. This action indicates the dip in gold price has run its course – one bullish indicator for gold prices is also when they post consistently higher lows. According to the CFTC Commitments of Traders report for March 5, there was a net drop of roughly 62% in gold futures. The precious metal continues to hold up well in the face of strong sales pressure. If you review the bull years for gold since 2001, the metal generally hits a bottom in the middle of March and then rallies through May. Expect a repeat of this for 2019. This rally could push gold prices higher than their February highs, which is also projected in the Money Morning gold price predictions. So, according to Krauth, it appears the gold correction has bottomed out. This and the gold price's typical seasonal trends throughout the year make for a great buying opportunity. To get you started on profitable gold investing this year, here's the road map for gold in 2019. 2019 has several indicators serving as strong gold price forecasts. While the direction of the dollar remains uncertain, Krauth stresses that gold can continue to rally in the face of a strong dollar. The DXY remains above its 50-day moving average and continues to trend higher. Now that gold prices are above their 50-day moving average as well, it looks like $1,300 could be the new support level. Many other precious metal stocks were attempting to push higher even as gold prices were sitting at $1,285 in early March. The VanEck Vectors Gold Miners ETF (NYSEArca: GDX) was trying to break higher between March 4 and March 7, which suggests we've seen the bottom of gold and a rise is imminent. There is also the gold-stocks-to-gold ratio, which indicates that gold stocks persevered better than gold during the correction and had a quicker bounce back. Since the new rally began, gold stocks jumped three times as much as gold itself. This kind of performance by gold equities could signal more strength on the way for both gold stocks and gold in the coming months. 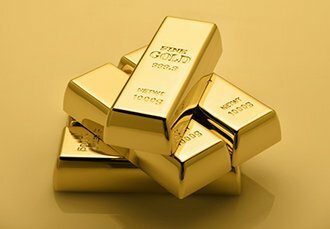 Even though gold took a slight break from its nonstop rally between August and February, there is encouraging price action indicating positive things ahead. Fundamentally, gold should continue its climb in 2019. Now, here's the best way that you can invest in gold in April 2019.